Psychotherapy is the dialogue between patient and therapist in the diagnosis and treatment of behavioral, crisis, and mental disorders. Psychoanalysis as formulated by Sigmund Freud is the first modern form of psychotherapy and this approach has given rise to several score of psychodynamic therapies. In more recent times behavioral, cognitive, existential, humanistic, and short-term therapies have been put into practice, each with a particular focus and each giving rise to variations in structure and content of treatment as well as therapeutic outcomes. These therapy approaches relate the patient/therapist dialogue to different aspects of the therapeutic process. For instance, behavior therapies focus on the patient's conduct and cognitive therapies treat the client's thought processes. 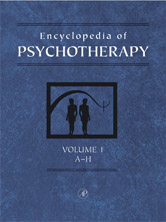 The Encyclopedia covers the major psychotherapies currently in practice as well as the classical approaches that laid the foundation for the various contemporary treatment approaches. In addition, the Encyclopedia identifies the scientific studies conducted on the efficacy of the therapies and review the theoretical basis of each therapy.